I loved this book. need more? OK. I can understand that. You know how some books just resonate with you? 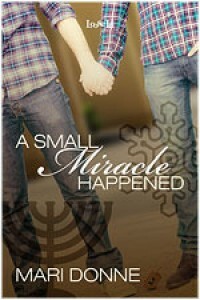 A Small Miracle Happened by Mari Donne is one of those for me. It is a beautiful story of two men from different backgrounds and faiths that happen to meet because of a package delivered to the wrong address. The story that follows is one that really captured my heart. Dan has just moved to a small town where there is not a Jewish community and he does not know very many people other than his co-workers. Hanukkah is early this year, coinciding with Thanksgiving and he is feeling homesick. When his grandmother sends him a package, it ends up delivered to the wrong address. The neighbor who receives the package is his hunky neighbor with the rainbow flag for a curtain in his window – the one that just caught him watching him as he was driving past on his way home. Christian (Chris), the neighbor, brings the package over. When Dan shows Chris what is in the package, a Menorah and other items for the Hanukkah celebration sent by his grandmother, Chris is truly interested and Dan explains the meaning of the celebration and lets Chris light the first candle. This is the beginning of eight days of them learning about one another. I loved the way this story presents these two men. They are just normal guys. But each one sees something special in the other as they get to know one another. There are no inflated egos, no debilitating angst, they are not polar opposites. They do have very different backgrounds religiously. Chris comes from a family that does not accept his being gay because of their religious beliefs. Dan does not have that problem in his family, although he has an uncle who wishes Dan were a bit more devout in his religious beliefs. They are observant and communicate with one another. This was really sweet and kept me involved in their story. I also enjoyed the friends and family that play such an important role in their lives. I also admit there is cooking and food is an important theme running through the book and I love this. This book packed so much into a short story. I thought it was well balanced and the characters felt real to me. It only encompasses eight days (plus a lovely epilogue) and put a huge smile on my face when I finished it. I can't ask for more from a holiday read.